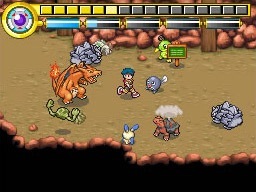 Following the heels of the recently released Pokemon Mystery Dungeon: Blue Rescue Team comes the forth Pokemon spin-off to be released on the Nintendo DS, despite the fact that we haven't seen a true release in the actual series since 2004 (and if you want to get technical about it then it goes as far back as 2003). However rather then being a simple cash in on the Pokemon success, Pokemon Ranger appears to be one of the more ambitious creations for the Pokemon name in recent years and could prove to be a surprising hit among a flow of quality titles hitting the DS this holiday season. Even though developer Ambrella has had a rocky introduction to the handheld realm with the release of the mediocre Pokemon Dash, Pokemon Ranger appears to make up for their first mistake. In it you'll take the role of either a boy or girl Pokemon ranger and be partnered with either Plusle or Minun depending on your gender. As a team you'll basically protect people from evil and other disasters. The concept is a lot like the Pokemon Mystery Dungeon titles, in that you'll go out on numerous missions to help protect the people of Fiore. By completing these missions your rank will go up, which opens up new areas and new opportunities, etc. This is where the touch screen comes in, with an item known as the "Capture Styler" (styler, stylus... clever). 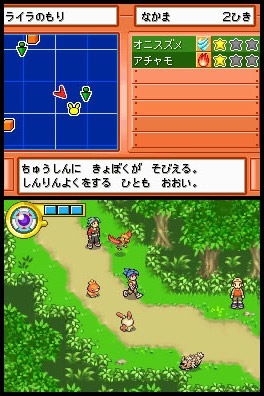 You'll engage in a type of mini-game where you use the stylus to draw circles around the Pokemon. The more advanced the Pokemon the more circles you'll have to draw around them. And they won't go without a fight either. They'll move around constantly and if they happen to collide into your capture line, it will break and you'll have to keep trying. The Capture Styler also has a health bar, and it can be attacked by each Pokemon. If they manage to deplete your health to zero before capturing them, you'll find yourself restarting from your last save point. All in all the game consists of 210 of the 386 Pokemon from the Ruby/Sapphire/Emerald generation. While it might not include all of them, the game does include a "Pokedex" tracking system which means all of you Pokemaniacs are going to have to track down all 210 of them for a special ending. On top of the available 210 it's been discovered that creatures from the upcoming Diamond and Pearl Nintendo DS games will also be available. How? Well it's unclear as of now, but more then likely they'll be given out via a special promotion (similar to the GBA give-a-ways) from Nintendo as we approach the release of Diamond and Pearl's release. Also as this is appearing to be the final Pokemon spin-off before the new games arrive, it also appears to be the last Pokemon game based on the current generation of monsters. So if you're all up in arms over the new critters (which you shouldn't be, because they rock) you better get your eyes set on Pokemon Ranger.